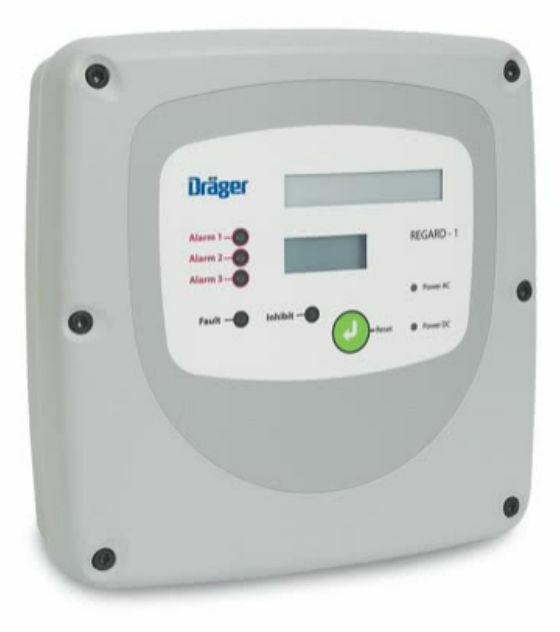 The Drager Regard-1 is a standalone, self contained single channel control system for the detection of Toxic, Oxygen and Ex hazards. The control system is fully configurable for a single input from either a 4 to 20 mA transmitter or a Drager Polytron SE Ex measuring head. The Regard-1 can either be connected to a 4-20-mA transmitter or to Polytron-SE-Ex mV sensing heads. There are three fully configurable alarm relays: rising or falling, latching or non-latching. The alarm status is displayed via three LEDs. They will flash with a new alarm, light up continuously to display an acknowledged alarm situation or extinguish if there is no alarm. The gas concentration is displayed continually on a large LC display. If the alarm thresholds are exceeded or if a fault occurs, the integrated audible alarm will sound. To indicate a transmitter or system fault, a fault relay is provided, a separate fault led is provided on the panel which will flash under new fault condition, light continuously under acknowledged fault condition or will be extinguished under normal or healthy conditions. During maintenance, the maintenance or inhibit relay can be used to report this special status via a remote display. The Regard-1 can be equipped with an optional TWA control module. This module enables the output of a TWA alarm as well as the repeat of a 4 to 20mA signal and the alarm states via a digital interface. To ensure the operation of the Regard-1 during a power failure, two batteries of 1.2 Ah each can be inserted into the integrated battery compartment. Depending on the transmitter used, they will enable an operating time from 30 minutes up to two hours. The batteries are re-charged by the Regard-1. The robust IP65 enclosure enables the installation of the control system at virtually any location within safe areas.